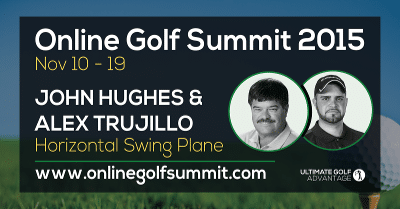 PGA Master Professional John Hughes and FlightScope USA Sales Manager Alex Trujillo joined the Online Golf Summit 2015 yesterday for their talk on the horizontal swing plane. As they explained, the horizontal swing plane is the direction of the club's sweet spot relative to the line, measured at the lowest point in the swing. At this year's Online Golf Summit, golf enthusiasts can get advice and tips from professionals as the content is streamed directly to them. We are privileged to have our team be among the knowledgeable panel of pro golfers, authors, presenters and coaches who share industry secrets to golfers who want to improve their game. It's not too late to register, the annual Online Golf Summit will be held through November 19th.